Each month Writers' Forum helps thousands of new and aspiring writers to achieve their dreams. It's packed with up-to-date market information, advice from experts in the publishing industry and inspiring stories and tips from fellow authors and writers. We also feature interactive reader workshops in fiction and poetry so you can see at first hand how to improve and successfully target your own writing. Our monthly writing contests for fiction, poems and flash writing are world-famous, awarding cash and prizes each issue, plus publication in the magazine. Want an in-depth critique to help you improve your poetry? Our poetry editor Sue Butler will send a detailed critique of up to three of your poems for a fee of £40. 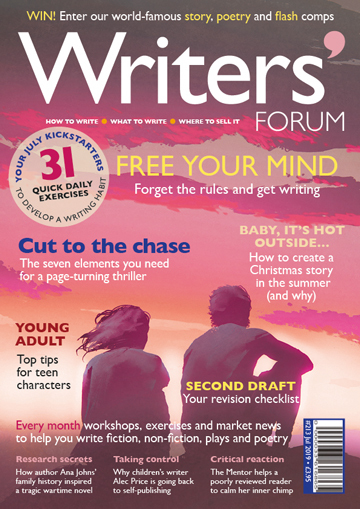 Writers' Forum is available at WH Smith and your local newsagent – just ask. For subscriptions please visit our publisher's secure website, where you can also order back issues. For a free sample, call 01202 586848 or write to the address below. Download Writers' Forum to your iOS or Android device. The App, including your first issue, is £2.99 and subsequent issues are just £3.99.